Dr. Pulnik is a board-certified, California licensed Naturopathic Doctor and a Functional Medicine Practitioner. Having a passion and belief in the holistic assessment of her patients, she guides people towards health and wellness. Ultimately, Health is not just the absence of disease, it is the feeling of positive vitality allowing the body and mind to reach its peak potential in order to live a more healthier, happier, life. Functional Medicine determines how and why illness occurs and restores health by addressing the root causes of disease for each individual instead of just treating or suppressing the symptoms. IT IS THE MEDICINE OF “WHY”! Dr Pulnik uses Functional Medicine to search for the underlying triggers and causes of your illness. She will look at the possible nutritional and biochemical imbalances that may be contributing to your illness. Through cutting edge lab testing that is rarely done under conventional settings, we can uncover underlying dysfunctions and imbalances causing people to feel the way that they feel. She will then customize a health program to your specific needs as an individual – interventions tailored to your unique physiology! This approach works particularly well for those living with chronic illness however also for those who are looking to improve their health and wellbeing in general. Please see the list below for some of the conditions whereby a Functional Medicine approach would be beneficial. Functional medicine practitioners look at the interactions among genetic, environmental, and lifestyle factors. The Functional Medicine model facilitates healing by restoring balance and bringing the mind and body back into alignment. Functional medicine practitioners look “upstream” to consider the complex web of interactions in the patient’s history, physiology, and lifestyle that can lead to illness. The unique genetic makeup of each patient is considered, along with both internal (mind, body, and spirit) and external (physical and social environment) factors that affect total functioning. 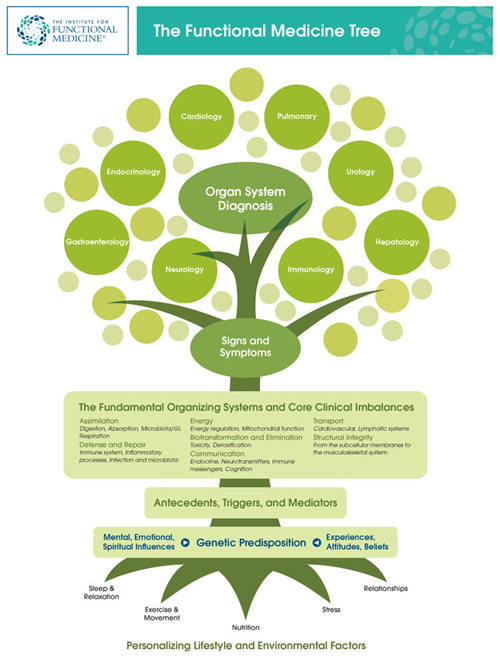 One way to illustrate where functional medicine falls in the continuum of health and healthcare is to examine the functional “medicine tree” as depicted. The current health care system is very well designed to treat urgent or ‘acute’ medical problems. If you go to the Emergency Department with a heart attack or a broken leg, the doctors who treat you will know exactly what to do. 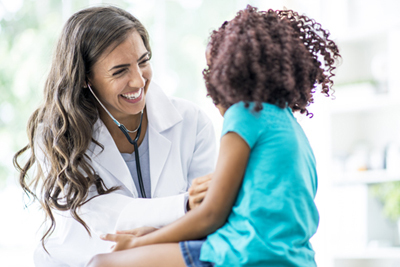 Doctors apply specific, prescribed treatments such as drugs or surgery that aim to treat the immediate problem or symptom. However, it does not take into account the unique genetic makeup of each individual or factors such as environmental exposures to toxins and the aspects of today’s lifestyle that have a direct influence on the rise in chronic disease in modern Western society. Our modern diet and lifestyle are out of alignment with our genes and biology. A functional medicine consultation is a consultation which will empower you to take control of healing yourself. 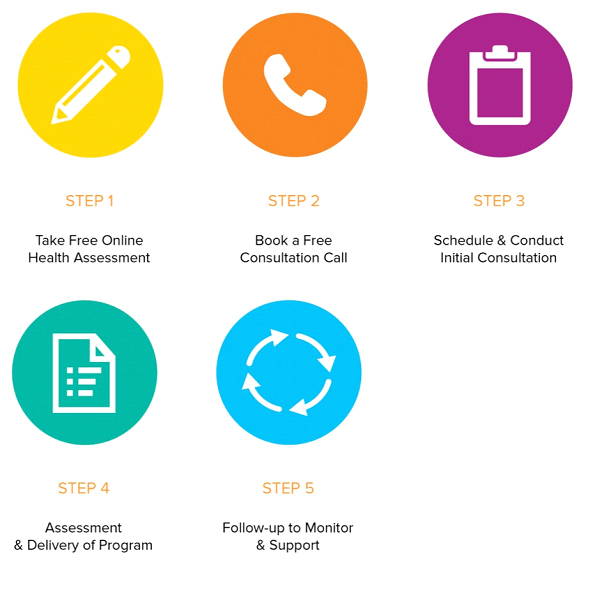 Dr. Pulnik offers an free 10 min telephone consultation to discuss your Health Assessment questionnaire results, and will provide insight as to how Functional Medicine can help you reach your wellness goals. After your free 10 min. telephone consult, the next step is to schedule your Initial New Patient Visit with Dr. Pulnik, either in-person or via Telemedicine. Looking at your NUTRITION, HYDRATION, SLEEP and RELAXATION. Addressing your MOVEMENT and help you manage STRESS. Support any NUTRITIONAL DEFICIENCIES and FOOD INTOLERANCES. Are you ready to begin restoring your health? Dr. Helene Pulnik ND offers both in-person office visits at her office, and Telemedicine Office Visits via Skype, Zoom and Facetime. Prior to your first consultation you will be sent a comprehensive questionnaire to complete online, in the comfort of your home. This form takes approximately 90 minutes to complete and we request that this is done at least two days in advance of the consultation to allow Dr. Pulnik an opportunity to review your information and prepare for your New Patient Visit. Please bring copies of all recent blood work and testing results to your New Patient Visit with Dr. Pulnik.